When you introduce the beautiful new baby to its siblings, you shouldn’t hold the baby. It can easily look like the sibling is being replaced by this small, new, sweet addition to the family. It can cause upset, or even make them feel a bit displaced. After all, they have been your one and only. So instead, it was suggested that you should lay the baby close to you, in a safe place on the bed, and then ask your child to come meet the baby! We asked Beatrice to come into our bedroom to meet the baby (we were only at the birth centre for 12 hours but this would work equally as well in a hospital etc). Beatrice was so excited to see me, and especially excited to meet her new sibling. We told her she was a big sister now, and she had a baby brother, and we asked her if she could help us, as big sisters do, to make him feel at home. We ‘investigated’ him, counting toes, looking at his big eyes, his long limbs, his curled up fingers, and his sweet smoochable lips! 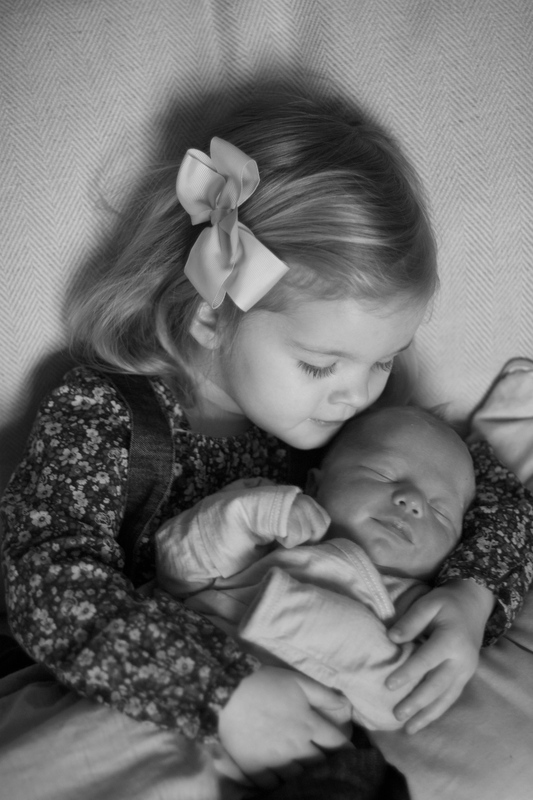 She really warmed up to the idea of exploring this new little man who was now part of our lives forever more. We also quickly realised (once we got to the belly button) that we had to explain why there was a bit of umbilical cord left over. So perhaps, we hadn’t planned a mini anatomy lesson, but it was such a good experience for all. It was a slow and sweet introduction to living with a newborn (illustrating to her how fragile newborns are, which is something we are still teaching every day 🙂 ). Then we told her his name, (she was the first to know), and she repeated it back to us. Hearing her say his big new name in her tiny toddler voice, with his little fingers curled around her hand, I must say, my heart felt bigger than the bedroom we all sat in. I will always think back to that beautiful moment when they first became best friends. Big sister, little brother. No drama or displacement experienced. And just the four of us, for the first time. ps – The photo of the feet are his 3-day-old feet next to her 3-year-old feet. I couldn’t resist, those newborn wrinkles and creases are so sweet. And above they are cuddling while he is still only 24 hours old… bliss! This is so lovely!! At nearly 30 weeks pregnant, I’ve been thinking lots about how my three year old little girl will meet our newborn and I’ve found this so comforting to read! Thank you!!! That’s great news Emma, I’m happy it helps! Good luck with the new baby and enjoy those last few weeks too! We were given the same advice and I have been conscious each time to have open and empty arms for older siblings and then go together to welcome our new baby. Our children are always the first to visit (I have had to stay in hospital with all my births) and I have always been quite strict with visitors, siblings get cuddle rights over everyone (this does annoy my in laws who do not think children should hold ne borns?!). We have some super stories we read before birth too, we all love Rosie’s babies! Good luck it is such a special time, the greatest gift to a child is their siblings I think! Motherhood can strip away your identity. Here's how to get it back!